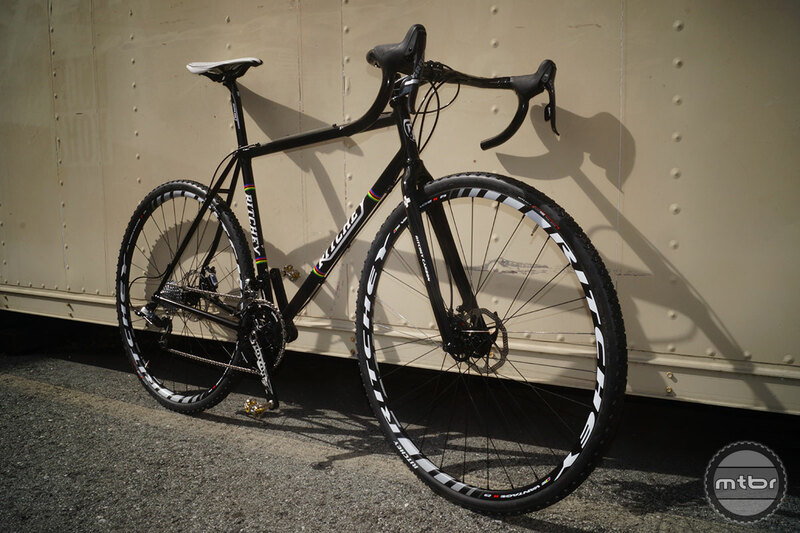 Last week we got a sneak peek at the bikes Ritchey will show at this weekend’s North American Handmade Bicycle Show (NAHBS) in Charlotte, NC. We were sworn to secrecy until the end of this week and get to show you one bike today and two tomorrow. 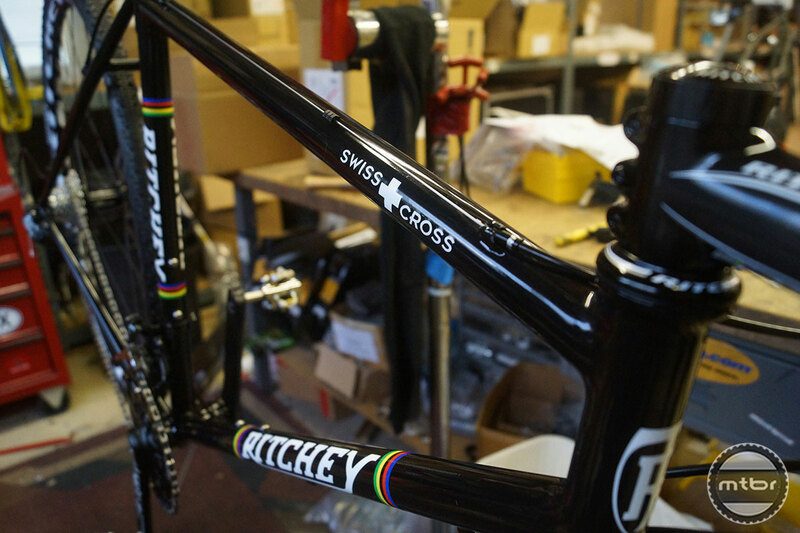 First up—the new Ritchey Swiss Cross Disc. 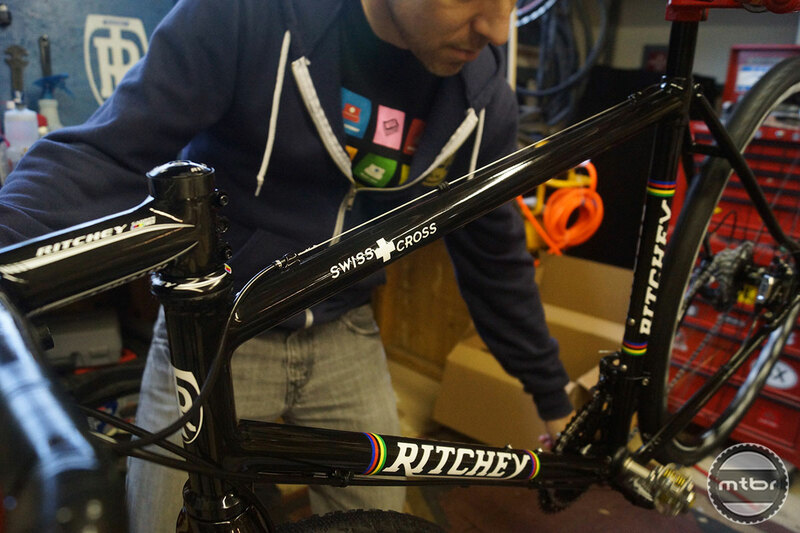 Ritchey Global Marketing Director Sean Coffey assembles the company’s first disc-compatible cyclocross frame—the Swiss Cross Disc in the company’s workshop. Fillet-brazed by Tom Ritchey himself, this handmade prototype will serve as the “golden sample” for the production version of $1,300 frameset the company will start selling in August—just in time for ‘cross season. It’s made of Ritchey Logic II triple-butted steel tubing and includes Ritchey’s new Carbon Cross Disc fork and a Ritchey Logic Headset. 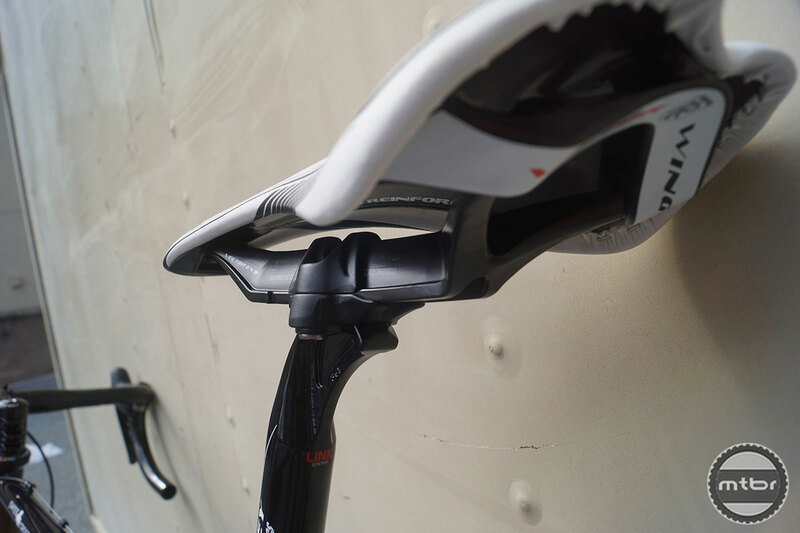 Ritchey will also offer the carbon disc fork for sale with a matte carbon finish in a non-tapered version for $450. 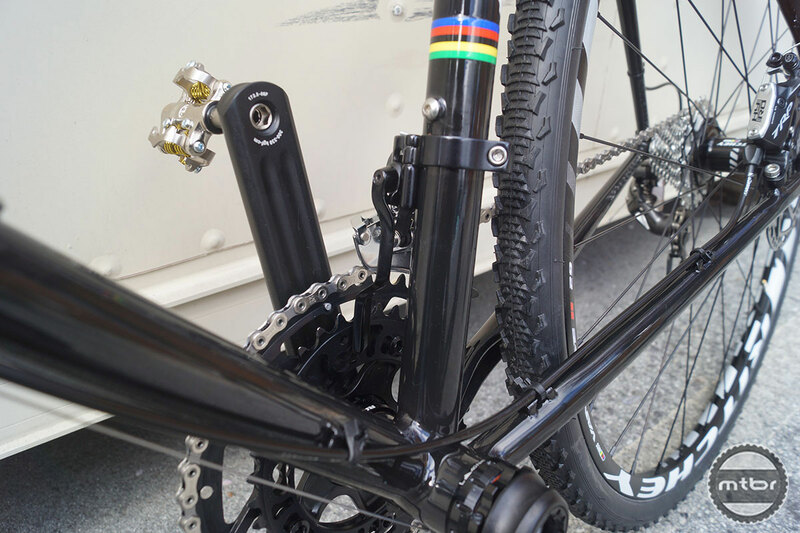 The bottom bracket of the Ritchey Swiss Cross disc is a study in minimalist beauty. The rear caliper of the Ritchey Swiss Cross disc is intentionally tucked-in tight to prevent interference when running with the bike. Tubing in the area has also been reinforced to counteract the additional braking forces in the seatstays and chainstays. 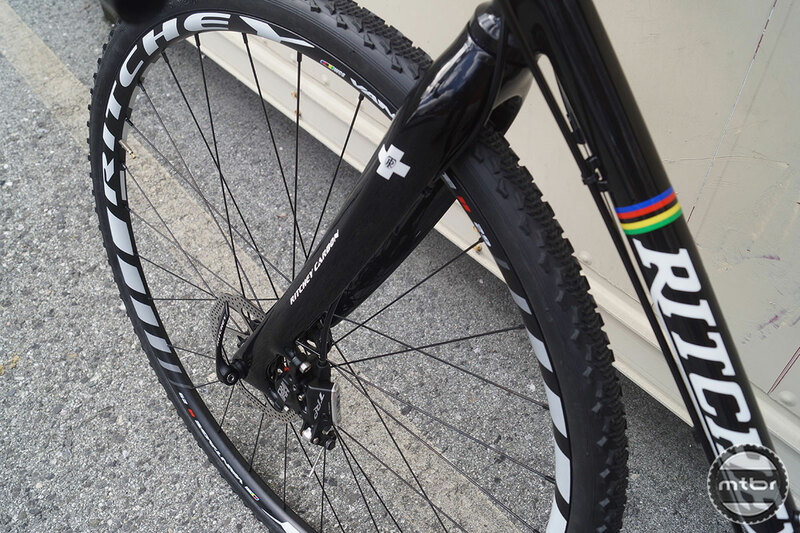 A simple world champion stripes-on-black graphics scheme along with the Swiss Cross on the top tube gives the bike a certain understated elegance. Coffey dials in the shifting on the Rotor crankset-equipped NAHBS show bike. 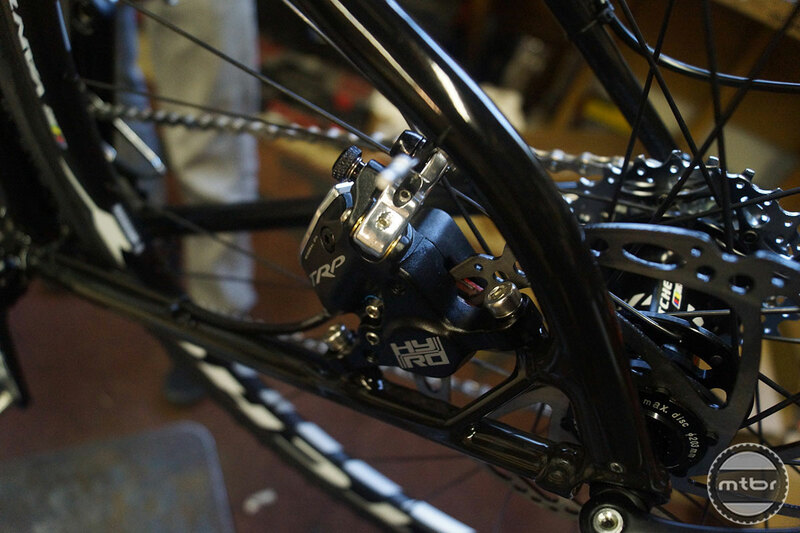 The NAHBS bike sports a pair of hydraulic TRP calipers that are cable actuated and can be used with standard brake levers. The NAHBS show bike includes Ritchey’s Vector monorail seatpost and saddle system Coffey says offers both lighter weight and better compliance than traditional systems. 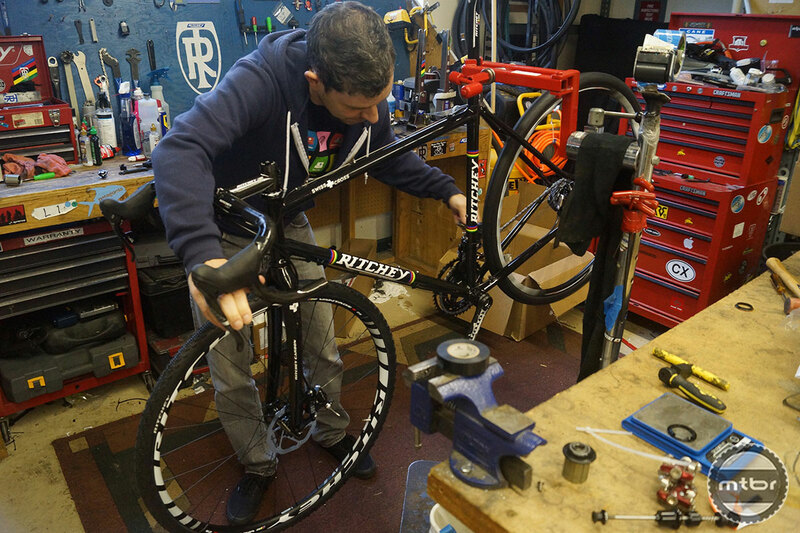 Coffey takes stock of his show bike—Ritchey frame, Ritchey fork, Ritchey bars, Ritchey Stem, Ritchey pedals, Ritchey saddle, Ritchey seatpost, Ritchey wheels, Ritchey tires, Ritchey headset and—eventually—Ritchey bar tape. For more information visit ritcheylogic.com. 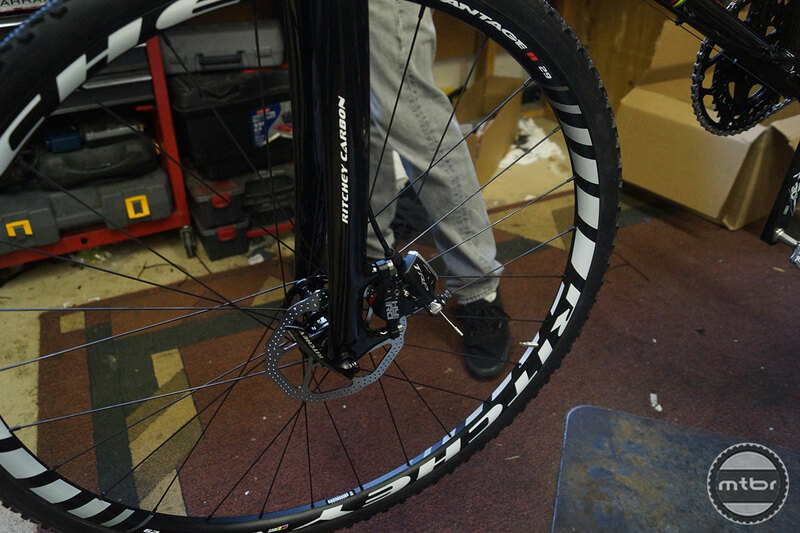 i would take a tom ritchey build cx disc, but these are all made overseas. 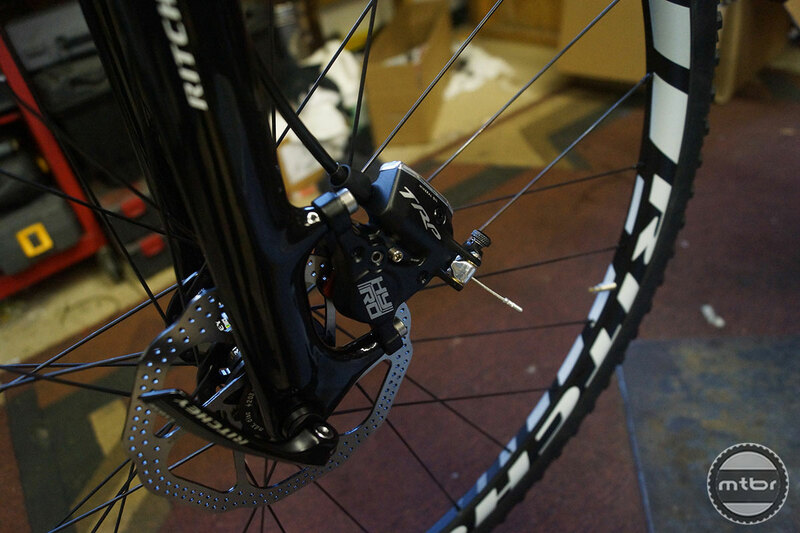 just don’t get how ritchey can get away with being and showing at nahbs. Oh ya, they build a one off and then gets their card punch to the show. what a joke. I do get your point on how Ritchey found the loophole to be able to attend the show; they do produce in very low numbers and models in part of their defense. What gets me is that most people overlook the fact that alot of carbon bikes and steel bikes are still “hand made” although it may be from the far east. At the NAHBS there are builders from Italy, Czech, Japan, Canada and many other places. I would take that Taiwan built Ritchey over some of the bikes I have seen pictures of at the show. They claim “Tom Ritchey filet brazed it himself” and it’s a prototype. That means it fits the rules. Unfortunately, 95% of the frames out there are made in Taiwan, most of the rest in Asia and a few in North America. If you want a hand made north american frame, find a custom tubing builder with a shop in his home. True North makes some, as do Brodie last I checked. Lynskey and Litespeed do too.